The kickstart shaft, Item 14 on Page 35 of the 2003 Husaberg Spare Parts service manual, shows the replacement kickstart shaft Part No. 230156-01. I think the final configuration was a 2004 model, which is listed in the 2004 Parts Book as 2003 Part No. 800.33.050.000. I strongly recommend getting the 2004 part number. The rivets on the silencer will loosen and wear as an oval. Replace regularly. It’s strongly recommended your speedometer is supported by a billet aluminum surround. The Panoram/Trailtech will break after a couple falls, and fitting a billet surround will work much better. The gear lever loosens. Use Loctite, or a longer screw with a locknut is better. The 2004 lever is made of curved alloy. Wiring tube splits – plastic is brittle. Shepherds crook the end to stop water entering. Use a zip tie and silicon. Water comes down the ignition wire tube, so kink 180d and zip tie hard! Drill hole in case from underneath. Will self-dry. 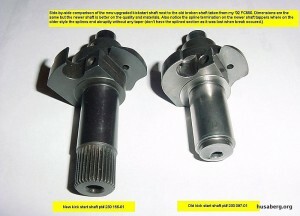 Fit loose split pin. To stop getting moisture in, silicon sidecover on. Running engine will push water out. Corrosion and rust is a reason for failure. Cover the ignition stator in Vaseline. Acres can be removed as actually unnecessary. Most wires around battery solenoid do little, stator wiring tube should be replaced and fed around back of starter motor. Change the fusebox to “staple” type fuse. Hits rear tire on first ride. Remove now or it WILL be removed for you-first ride! Breaks after a few falls. Weld to strengthen appropriately. Reduce punctures. Can run tire pressures safely down to 5-8psi in the mud.